The new rules for differentiating, branding, and marketing your professional services firm. In the past, most professional services firms could get by simply relying on traditional marketing tactics. For most firms, networking, attending benefit dinners, advertising in the Yellow Pages, and merely adding the new partner’s name to the office sign was enough to stay top of mind. Today, everything has changed. Even traditional industries need to figure out how to differentiate and compete in our digital, socially-networked society. Today’s professional services marketers know that if they want to stand out, they have to do something different. Read Bold Brand to find out how, and get ready to get Bold! Partners and owners of professional services businesses, and marketers who focus on the professional services industry. Professional services encompasses business-to-business consultants who trade their expertise for a fee. This includes technical experts, architects, consultants, attorneys, accountants, engineers, coaches, marketers, and software as a service (SaaS) companies. If you describe your business as an “agency,” “firm,” or “practice”, this book will offer practical marketing and branding advice tailored especially for you. 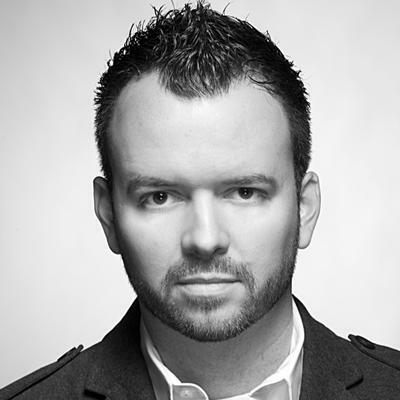 Josh Miles, a caffeine and Twitter addict, is the principal and founder of Miles Design LLC, an Indianapolis-based, award-winning branding firm specializing in brand strategy, corporate identity, website, and user interface design. His expertise is highly sought after by professional services firms—including architectural firms, legal practices, engineering offices, and software companies—as well as corporations, non-profits, and university design programs. Josh serves on the board of directors for OasNet, an international church planting and resourcing organization, and the Indianapolis Chapter of the American Advertising Federation. Josh is also involved in several other start-up tech companies based in Indianapolis, including iheartlogos and Big Blue Wagon. Prior to founding Miles Design, Josh served as an art director and as an adjunct faculty member for IUPUI, Herron School of Art and Design, and The Art Institute of Indianapolis. Josh is a long-time member of AIGA (the professional association for design), having served three years as the Indianapolis chapter president. He is currently involved in AIA, SMPS, Verge, and Rainmakers. 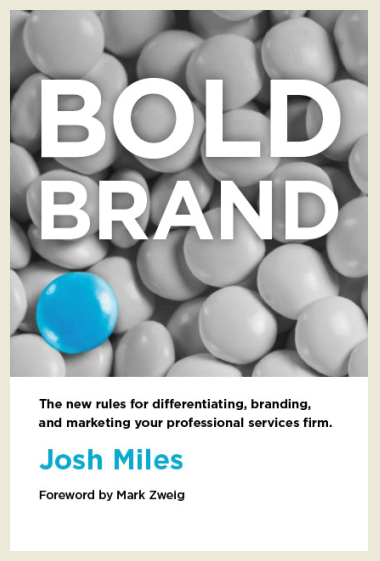 Bold Brand is Josh’s first book. He lives outside of Indianapolis with his wife, 4-year-old daughter, and newborn son. Miles Design is an award-winning design firm specializing in branding for professional services firms. Miles Design offers branding services that extend far beyond logo design, from development of brand strategy, to positioning, voice, website design, social media strategies, and more. The Bold Brand™ process was developed by Miles Design to identify their clients’ most compelling differences, and leverage them for the greatest possible impact. Bold Brand seeks to uncover each firm’s brand essence, which becomes the driving force behind all future communications—both internally and externally. Connect with Josh on Twitter @joshmiles, LinkedIn, or Facebook. Your brand is the sum of all the elements that affect how your organization, its products, and its services are perceived. You can’t choose not to have a brand. It’s an inherent part of everything you do and say. To achieve the greatest level of success, your brand must be deliberately crafted. That’s why there’s Bold Brand™. Bold Brand™ is our proprietary branding process. It’s designed to leverage the potential of your organization. By uncovering the most compelling attributes of what you offer—and by understanding what drives your audience—the Miles Design Bold Brand™ process uniquely positions your brand for success. When you understand the core of your brand, the opportunities to leverage it are limitless. Contact us, and we’ll show you how our branding firm can make a difference for your organization. What is your new book, Bold Brand, about? Bold Brand gives professional services business owners (and B2B marketers who want to help them) a clear pathway to finding a niche, positioning their firm, and branding their expertise around this niche. New marketing technologies and opportunities are generated today at a head-spinning pace. Social media. Viral videos. Mobile. But where do savvy business owners or marketing firms turn to decide which tactics to chase after, and which to let pass by? Where in the heck is a professional services business owner supposed to start? Boardrooms and agencies alike feel the pressures of today’s biggest marketing challenges. Should they expect salvation to come in the form of the hottest, trendiest new social media flavor of the week, or rely on the advice of their most seasoned marketing consultants? The root of this problem lies in the absence of a practical B2B framework from which to make solid decisions and build profitable brands. What was missing from other branding books that you are addressing? Doesn’t just about every book you’ve ever read on marketing or branding focus on the same B2C and retail examples? Apple, BMW, Starbucks, Target, and Zappos… it’s not that these aren’t great stories, but it’s tough for B2B and professional services firms to apply anything from these storied retail giants. We thought it was about time that someone talked about how architects, engineers, attorneys, accountants, technology firms, consultants, and other B2B businesses could truly differentiate themselves from their competition. Where other books have sought to define and harness the power of branding, this is a look at building on those definitions and simplifying branding exercises into a straight-forward framework, to provide guidance for developing, positioning, and improving organizations from the ground up. And we thought it was essential to share a few case studies of firms who get it right, too. You’ll hear case studies from architects, engineers, technology firms, consultants, attorneys, and more – stories that highlight their willingness to try something different, and to stand out from the sea of sameness. In the past, most professional services firms could get by simply relying on traditional marketing tactics. For most firms, networking, attending benefit dinners, sponsoring a little league team, advertising in the Yellow Pages, and merely adding the new partner’s name to the office sign was enough to stay top of mind. Today, everything has changed. Even very traditional industries need to figure out how to differentiate and compete in the digital, socially-networked world. Why should content marketers invest their time in reading this book? What will they learn from it that they can’t learn anywhere else? Have your clients ever asked you, “What’s the difference between advertising, content marketing, and branding? And how do each of them apply to my website?” Fear not. Bold Brand is here to help. Bold Brand is a very accessible look at a process and framework that any professional services firm can follow to identify, develop, and leverage their brand essence to market themselves in a truly unique way. Even if your content marketing practice doesn’t offer branding services, Bold Brand is a great primer on the topic for both you and your B2B clients. Today’s professional services marketers are finally figuring out that if they want to stand out, they have to do something different. Read Bold Brand to find out how, and get ready to help your clients get Bold! A simple checklist for determining whether your brand is due for an overhaul. How will your book make a difference for content marketers? Historically, the professional services market has been largely under-served and passed over by marketing, branding and design firms for better-known, sexier business to consumer clients such as consumer packaged goods, automobile manufacturers and sports franchises. Today, professional firms are beginning to explore the power of building a brand beyond the reach of just their named partners. The problem is, these professionals (and even marketers who try to serve them) frankly don’t even know where to start. Bold Brand will help define which branding and marketing issues are most important to address first, and which new tactics and cutting-edge marketing technologies can be explored and changed naturally as a brand grows. This book seeks to give professional services business owners, and marketers who wish to help them, a clear pathway to finding their niche, positioning their firm, and branding their expertise around this niche. Do you provide any templates, work sheets, checklists, step-by-step guides or case studies that will help content marketers? If so, please briefly explain what kind of tools you provide. Yes! The entire book guides the reader through our process, providing “homework” at the end of each chapter. And the last chapter is a DIY brand audit, which provides a checklist overview of everything we discuss in the book, and a great snapshot of where marketers should prioritize their efforts to begin. It was great interviewing our friends and clients to hear their stories of branding and marketing success in the professional services world. Some of the most interesting stories came from everyone from decorated CMOs, to “self-taught” marketers who were just experimenting until they found something that worked. And the good news is, you don’t have to be in the C-suite or experiment to figure it out. You can read it right here!